Knowing what's important to my patients is important for me. My main goal with each patient encounter is to listen to their concerns and educate and engage them in the formulation and execution of the treatment plan. 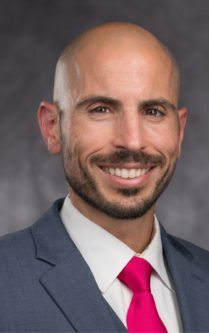 Dr. Pappou is double fellowship trained and board certified in orthopaedics by the American Board of Orthopaedic Surgery and specializes in hand, wrist, shoulder and elbow surgery, and microvascular surgery. With a focus on patient education, Dr. Pappou works with patients to make a joint decision regarding treatment. Dr. Pappou has authored more than 15 articles, reviews, book chapters and abstracts and has delivered more than 15 lectures and presentations for organizations such as the International Meeting on Advanced Spine Techniques and the North American Spine Society. Additionally, Dr. Pappou is a member of the American Association of Orthopaedics, American Board of Orthopaedic Surgery and the American Association for Hand Surgery. Dr. Pappou is fluent in six languages and enjoys running, reading, scuba diving, traveling and studying ancient Greek philosophy. I have had nothing but courtesy, respect and compassion from Dr. Pappou’s schedulers. Especially Amber! Thank you, team! Keep up the good work! Dr. Pappou is the perfect example of excellence in the areas of surgery and patient care. I had shoulder surgery and within two weeks I had made great progress. At six weeks out, my range of motion was equal to or more than the shoulder that did not have anything done to it. I’ve gone to Dr. Pappou for several years for various issues and he has always been kind and so good to explain exactly what the problem was and how to deal with it. I have recommended him to several people over the years! I was extremely happy with the results of my surgery. Dr. Pappou is an excellent surgeon. He shared with me exactly what he was going to do surgically. I would highly recommend Dr. Pappou. I had the misfortune of breaking both my arms in an accident and Dr. Pappou operated in November. It’s now February and I am completely healed! The physical therapy staff, Morgan and Greg, were beyond terrific — very compassionate, knowledgeable and positive attitudes. If you want the best care I highly recommend Dr. Pappou and his staff! He did carpal tunnel releases, endoscopically, on both wrists about three weeks apart. The outcome has been excellent. I have full use of my hands! Dr. Pappou and his team are wonderful! After a fracture of my wrist, the first orthopedist I saw did not feel confident to do the surgery. Thankfully, Dr. Pappou specializes in hand/wrist surgery and happened to be at the Citrus Park location the same day and was able to see me. He explained the procedure well and I was scheduled for surgery in two days, which was much appreciated given the severity of my pain. His office staff was great to work with. Everything was handled quickly and efficiently. It’s been three months since my surgery and I am extremely happy with the results and the care I received. I couldn’t recommend him enough. Thanks, Dr. Pappou! I have great respect and confidence in Dr. Pappou. My carpal tunnel on my right hand healed well with minimum down time. I am ready now for the left hand surgery. I have recommended Dr. Pappou to all my friends that have a need for orthopedic surgery. Dr. Pappou was wonderful and his whole staff was great. Everyone took time for me including Dr. Pappou. It meant a lot to me with the difficult time I’ve been having. Thank you guys! Dr. Pappou is an excellent physician. He is caring and knowledgeable. He listens and spends adequate time with his patients. Best experience I’ve ever had for a medical issue. Dr. Pappou did a spectacular job on my hands and wrist! Excellent staff, friendly, and helpful. Dr. Pappou was great! I would highly recommend Dr. Pappou! He always had my best interest in mind. I had scheduled excellent home health care after he did great surgery and my pain management was great. The whole experience of evaluation, planning, and execution of treatment of my elbow was flawless. My hospital experience was fine and the follow-up was as expected. I really liked Dr. Pappou especially the thoughtful action of sending out a card after the surgery, signed by Dr. Pappou and the hospital staff. I’ve been given Dr. Pappous name to several friends. He takes his time to answer all of your questions. He will also explain exactly what the he will be doing. Dr. Pappou’s bedside manners are outstanding. His staff along with physical therapy are all very pleasant. The office is clean, professional, and I am very happy with my rotor cuff surgery. Dr. Pappou TRULY cares. Great doctor! Thank you Dr. Pappou from my initial visit, surgery, and therapy. In 2016 I fell and shattered my right elbow. Dr. Pappou was on vacation and his partner Dr. Grayson attended my elbow with excellent results. In spring of 2017, I started having problems with the thumb and forefinger of my left hand. Dr. Pappou had me do some therapy with a mobile tens unit and gave me a shot of cortisone. We worked for 5+ months and it just wasn’t getting any better. Dr. Pappou said we could do surgery and I jumped at the chance. I was tired of the pain and the inconvenience. He scheduled me for November 16th and on December 12, 2017 he released me from his care. I’ve had no pain—didn’t even take pain pills after surgery. I am so HAPPY with their work! That said if I have any additional orthopaedic problems I won’t go any where else. I was very pleased with the preparation and surgery. It was painless. Everything was done according to schedule and the healing process seems to be working as specified. Thank you! For as horrific as an injury as my husband’s was, Florida Orthopaedic Institute was a God send. From the front desk, intake nurses, Dr Yi (initially) and ultimately Dr. Pappou was such a wonderful experience. Long story short, my husband fell off our boat at the boat ramp 6-7’ approx. and shattered his wrist. We first saw Dr. Yi, who upon seeing the X-rays told us we needed to “see the hand/wrist guy”, at which point he pulls out his cell and calls the location where Dr. Pappou was seeing patients that day. He got us in the next day, in the Palm Harbor office. To say Dr. Ioannis Pappou is a great doctor really doesn’t describe the consummate practitioner he is. Dr. Pappou is one of those rare specialists you get (for us, probably only once in our lifetime) who immediately calms you. He has the most amazing bedside manner. He explains everything in such great detail, and in the most relatable way. He ensures you understand, but doesn’t do anything that makes you feel like he’s talking down to you. We recently had our last appointment with him, and honestly while happy with the phenomenal progress my husband has made, were also a touch sad that we won’t have any reason to see Dr. Pappou anymore. He is a great man, all around. Ridiculously knowledgeable in his disciplines, kind beyond belief, and quite simply a pleasure to get to work with. Dr. Pappou, THANK YOU from the bottom of our hearts, for putting David back together so expertly! My son, Kevin, had a seizure July 2017 and fell, which resulted in a severe fracture of his left upper arm. Dr. Pappou was recommended by Kevin’s primary physician. Going into surgery, Dr. Pappou explained that due to the severity of the fracture, he had several options to repair the bones, one of which was a shoulder replacement. He repaired Kevin’s bones without the shoulder replacement and after several months of physical therapy, Kevin has full use of his left arm. I would highly recommend Dr. Pappou for this type of injury. My son, Kevin, had a seizure in July of 2017 and fell. This fall resulted in a severe fracture of his left upper arm. Dr. Pappou was recommended by Kevin’s primary care physician. Going into surgery, Dr. Pappou explained that due to the severity of the fracture, he had a few options to repair the bones, one of which was a shoulder replacement. He repaired Kevin’s bones without the shoulder replacement and after several months of physical therapy, Kevin has full use of his left arm. I would highly recommend Dr. Pappou for this type of injury. Dr. Pappou successfully operated on and resolved the problem with trigger finger on my right ring finger and thumb. He quickly analyzed the problem. Surgery was conveniently scheduled. I did not require physical therapy during the healing period nor thereafter. His office staff if friendly and efficient. Dr. Pappou is friendly, yet quick and efficient. Dr. Pappou is very personable, professional, and detailed. His staff is nice and efficient. His care and experience are top notch and he has taken care of my family and I this past year. In 2016, I fell and shattered my right elbow. Dr. Pappou was on vacation and his partner, Dr. Grayson, attended to my elbow with excellent results. In spring of 2017, I started having problems with the thumb and forefinger of my left hand. Dr. Pappou recommended physical therapy and gave me a shot of cortisone. Together, we worked for five months and I was not getting better. Dr. Pappou then recommended surgery and I jumped at this opportunity. My surgery took place on November 16th and today, December 12th, he has released me from his care. I have had no pain, I did not even take pain pills after surgery. I am so happy with their work, should I have any additional orthopedic problems, Florida Orthopaedic Institute is the only place I would go! Dr. Pappou and his staff are simply the best. They are very patient and I have complete confidence in their work. 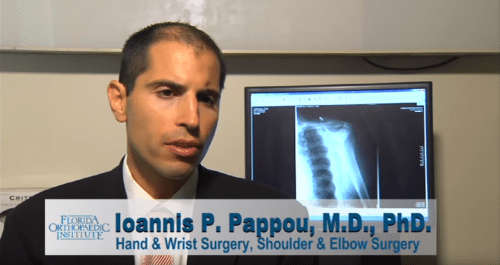 Dr. Pappou helped me through an extremely difficult time with a dislocated elbow. I highly recommend this practice. Great doctor! Thank you, Dr. Pappou..from my initial visit, to surgery and therapy. I received excellent care after I broke my shoulder on July 2, 2016. I had surgery July 7, 2016 performed by Dr. Pappou, who not only managed to save my own shoulder, but also left me with a smaller scar than I expected. The after care was wonderful. Also, the ability to go to physical therapy at the site in Palm Harbor was terrific. Kudos to PT guys for their excellent care, support, and sense of humor! Dr. Pappou, you did an excellent job and I am grateful!